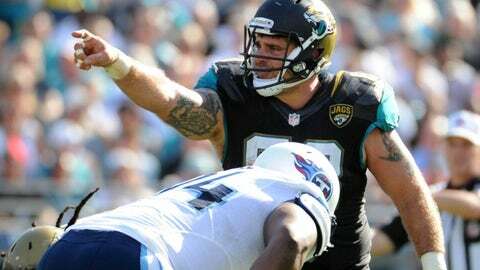 Center Brad Meester spent his entire 14-year career with the Jacksonville Jaguars. JACKSONVILLE, Fla. (AP) — As Brad Meester perused the playbook this week, he noticed one called "Pass 5 Weak Screen to Brad." Meester figured it had to be for offensive tackle Cameron Bradfield. Nope. It was for Meester, a going-away present of sorts for the veteran center who recently announced his retirement. Meester welcomed the opportunity for his first reception and maybe even a touchdown in his final home game. He came oh so close to scoring, too, in a 20-16 loss to Tennessee on Sunday. "It was pretty cool to almost score," he said. "I was a little nervous about it. I had never played any other position besides inside, never caught a ball. We worked it all week. We worked it three or four times. I really wasn’t certain if it would work because we did do a whole presentation 10 minutes before I went out there and then I reported at an eligible position. I thought, `Oh man, they’re going to pick up on this.’ And they didn’t pick up on it. I was open and I got a few yards. I would have loved to have scored." Meester spent his entire, 14-year career in Jacksonville. He holds the franchise record for games played and started (208). The team recognized Meester before the game by only announcing him in pregame introductions. It was a nice touch. The Jaguars also honored him after the game, presenting him with four framed jerseys. Meester reported as an eligible receiver, moved from center to tight end and then slipped out right for the screen pass. Meester caught the ball and had fellow offensive linemen Uche Nwaneri and Austin Pasztor out front and plenty of open space. "I was exhausted by the time we got to that play," he said. "It was kind of a long drive. We just ran outside zone. I fell down on the play. People landed on me. I was exhausted. Everybody was exhausted. I got to the huddle and they were yelling, ‘Heavy, heavy, heavy.’ I was like, `Uh oh,’ that means I’m going in at tight end. "It worked out perfectly. The end went inside. It popped open. The thing that ran through my head was, `Don’t drop the ball.’ I knew I would catch a lot of flak if I got open one time in my life and I dropped the ball. That was the one thing I was focusing on is catching it. I caught it, got a few yards, would have loved to have scored. That’s something I will always remember." There was one huge problem. Meester ran into Nwaneri’s back –maybe somewhat expected for a guy running with the ball for the first time since his high school linebacker days. "Brad’s not a running back," Nwaneri said. "We didn’t expect him to juke anybody out and get into the end zone, but we were hoping that he would get into the end zone with a path that we cleared for him." Added Pasztor: "Have you seen his hands? His fingers are all bent every which way. It is remarkable that he can hold onto the ball. He did a great job." The Jaguars called timeout to get Meester back at center, and fans responded with a standing ovation. It was one of many for him Sunday. He got emotional as he ran onto the field one last time. He felt it again when he noticed congratulatory signs all around the stadium as well as an oversized picture of his mug. His most touching moment came after the game, when he addressed family, friends, teammates, colleagues and fans on the field. His wife, all six daughters as well both parents donned Meester jerseys for the occasions. "I didn’t break down and cry," Meester said. "I did get emotional. It was an emotional time." Meester’s final game will come next week at Indianapolis, about 360 miles from his home in Iowa City, Iowa. He will have family and friends on hand for that one, too. He also invited 8-year-old Luke Akerstrom and his family to join the team on the charter flight to and from Indy. Akerstrom had a seizure several years ago that left him partially paralyzed, and Meester provided motivation during his lengthy and still ongoing rehabilitation. Meester delivered the news to Akerstrom after the game, drawing tears from those nearby. "What a day," Meester said, sweat still dripping from his face. "What a day." Not a bad career, either.